Welcome to Full Version Software Review. SQLBackupAndFTP is a powerful SQL Server backup software for Windows. It comes with many features you need to backup your Microsoft SQL Server databases to many cloud storage such as Google Drive, Amazon S3, Dropbox and some others. There is also version for MySQL Databases backup called MySQLBackupAndFTP. 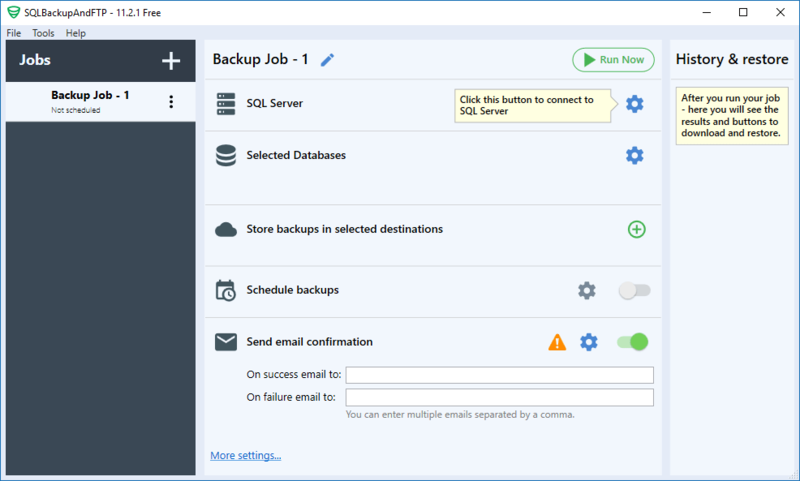 You can automate the SQL Server database backup with this software. Set up once and the backup will run in regular basis. When we run SQLBackupAndFTP, it will scan your network automatically. This will reduce the time you spend to look for SQL Server on your network. However, you can also manually connect to SQL database manually, as long as you have the name and login information for the SQL Server. Another important feature that exist is the encryption capability. Your backup transfer will be secured by a strong encryption. The backup scheduling also very neat and useful. This program can stay connected to the database so you can perform regular backup based on your schedule. System administration can opt-in the email notification to each backup job. SQLBackupAndFTP 11.2.1 brings a lot of improvements and bug fixes to the existing great features. If you have valid license you can upgrade for free. For new customer or user, you may download the free 14 days trial before deciding to purchase the SQLBackupAndFTP full version.